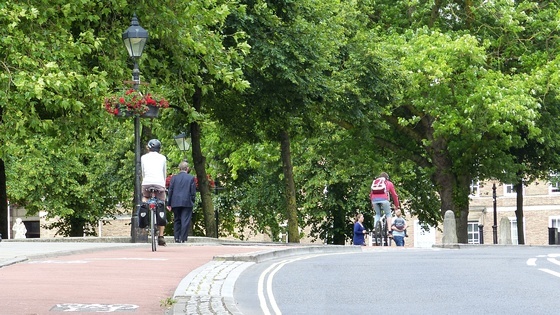 Better cycle infrastructure will help cyclists feel safer on the road, and may encourage more people to cycle. Increased cycling will reduce air pollution and motor vehicle congestion if people switch from using their cars. Cycling provides a big health benefit to those people who do not already exercise regularly. Increased cycling uptake has a number of advantages. Compared to driving, cycling has a profound health benefit on the cyclist. There are benefits for wider Bristol too, which will experience less air pollution and congestion as a result of fewer cars, and increased cyclists. Cycle infrastructure increases the uptake of cycling. This is because cyclists feel safer, and feel more welcome on the road. The benefits of cycling far outweigh the risks to the cyclist. This is shown in the graph below. Cycle infrastructure increasing uptake of cycling is from Pucher & Buchler (2008). The analysis establishes countries with high prevalence of cycling (Netherlands, Denmark, Germany) and compares the cycling infrastructure with countries of much lower cycling uptake (e.g. USA, UK). The analysis uses case studies to create a robust conclusion on the effects of cycling infrastructure. Statements regarding the benefits of cycling outweighing risks - and the above graph - are taken from Rabl & Nazelle (2012). The paper compares health impacts in a shift from car to bicycle transport. The paper uses data from the WHO (World Health Organisation) to calculate benefits from cycling, and makes the following assumptions: the commute is 5km (one way), 5 days a week, 46 weeks a year, in a large city (>500,000), with the risk exposure based on that experienced in Paris and Amsterdam. A separate study has shown the health benefits of cycling outweigh the risks by a factor of twenty to one. The study by Hillman (1993) calculated risks and benefits from the National Travel Survey and the Population Census in conjunction with studies from the USA and UK. The figure is a loss of life years from health risks of inactivity, compared with the likely loss of life years in the event of an accident. In addition, there is robust evidence as to the health and mental well being benefits of regular cycling, and the lower risk of death and disease (Cavill & Davis, 2007). Hillman, M. (1993) Cycling and the Promotion of Health. Policy Studies 14 (2) pp. 49 - 58. Pucher, J. & Buehler, R. (2008) Making Cycling Irresistible: lessons from The Netherlands, Denmark and Germany. Transport Reviews 28 (4) pp. 495 - 528. Rabl, A. & Nazelle, A (2012) Benefits of shift from car to active transport. Transport Policy 19 pp. 121 - 131.